It’s important to take care of your vehicle and one of the easiest things to do is to check your tires. When it comes to safety, tires are one of the most important components of your vehicle. With a vast selection of tires, you’re sure to find what you’re looking for at Central Maine Chrysler Dodge Jeep Ram FIAT. When you’re searching for the perfect new vehicle for your lifestyle and budget, there’s no car dealership in Maine quite like Central Maine! Here at Central Maine Chrysler Dodge Jeep Ram FIAT®, we have a wide variety of cars for sale, including new Chrysler sedans, used Dodge muscle cars and Certified Pre-Owned Jeep SUVs. We even have tough Ram trucks and funky new FIAT cars that will add a dose of bold style to your daily drives. When you come to our Waterville car dealership, you’ll work with expert salespeople who truly care about providing you with the best possible experience. Plus, we’re a no doc fee dealership, which means you’ll never pay administrative fees, handling charges or dealer prep fees. You’ll just pay for your vehicle! Stop by our car dealership near Augusta, ME, today, and you can get started selecting the new car, truck, SUV or van that’s right for you. Shop our new vehicle inventory, and you’ll find plenty of new Jeep vehicles for sale, including the popular Jeep Grand Cherokee and Jeep Wrangler. If you’d prefer a new truck, checkout the new Ram 1500 or heavy-duty Ram 2500. Shopping on a budget? We also have plenty of affordable used cars for sale. We have high-quality used Chrysler models, including the Chrysler Pacifica and Chrysler 300. We even have Certified Pre-Owned Dodge and FIAT cars, including the bold Dodge Charger and FIAT 500. No matter what you decide on, our FIAT, Chrysler, Jeep, Ram and Dodge financing experts can help you get the lease or loan you need to take it home! Down the road when your vehicle requires service, simply bring it back to our Chrysler, Dodge, Jeep, Ram and FIAT dealership for the expert care you deserve. Our Chrysler, Dodge, Jeep, FIAT and Ram service center can handle all your maintenance and repairs. We’ll take care of your routine oil changes and tire rotations, and complete your brake service and transmission repairs. We can even take care of your collision repairs at our collision center near Bangor, ME. Our service team also makes it a point to use OEM Mopar parts in your repairs, ensuring a seamless fit and optimal performance. 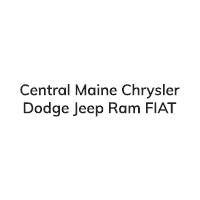 Central Maine Chrysler Dodge Jeep Ram FIAT is conveniently located at 300 Kennedy Memorial Drive in Waterville, ME, which makes us just a short drive away from Augusta, Lewiston, Brunswick and the rest of central Maine! We can’t wait for your visit.